Peter Sutcliffe, the Yorkshire Ripper was born with an 8th house stellium. A stellium is a group of five or more planets contained within the same sign or house. This configuration is not as unusual as it sounds as the Sun, Mercury and Venus are frequently close enough to be in the same sign or house. All that is needed to create a stellium would be the Moon which would join those three on a couple of days each month and then a slow moving planet so we are talking about 10 days a year probably on average. On those days anyone born in mid-afternoon would be likely to have this grouping in the eighth house. Sutcliffe’s chart is very unusual, however in that neither the Sun or Mercury are included. It’s always difficult to discuss the charts of serial killers or individuals who are so obviously seriously mentally disturbed. One problem is that people might look at such a chart and presume that this is the astrological signature for a psychotic mass murderer and possibly look for similarities amongst their friends, relatives, neighbours or more likely enemies. Astrology does not work like this, each birth chart is completely unique. The interpretation of astrological symbols is about applying intuition and experience to each chart and looking at how the symbols are manifesting in that particular case. The 8th and 12th houses are the most difficult to pin down, the symbolism covers such a range and depth of experience, its very dangerous to attempt prediction from these areas. It is true that the 8th house is traditionally linked with death but that certainly does not mean that we should go around looking for people with a group of planets there and lock them up just in case. There’s been plenty of examples in history of astrology being badly misused. Any kind of astro eugenics would be a serious abuse of the subject. This may be one of the reasons why the universe seems quite content with most normal humans knowing little or nothing about astrology. Capricorn Research has always found it bizarre that billions of people coming and going on their paths across our own planet seem content to ignore the glaringly obvious signs that are clearly pointed out every night above their heads. The simple fact is that if we work on ourselves consciously and allow a certain openness in our minds we will inevitably become aware of the nature of the world around us and astrological pointers would be obvious to all. If we keep our use of astrology to understanding things rather than trying to manipulate it to reinforce our own prejudices, it is the most valuable tool we can have in this life. It can even help us come to terms with the horrendous actions of someone like Peter Sutcliffe but we do have to look at the chart in depth. Most people, even if they profess to not believe in astrology, know their own Sun signs. For many online daters, it might be one of the first questions asked. So if the answer was Gemini, a number of things might go through their mind but its fairly safe to say serial killer would not be one of them. Even if the punter was a keen astro dater and got the response Gemini Sun, Cancer Moon and Sagittarius rising, they would be thinking fun, chatty and friendly but also quite sensitive and caring. They certainly wouldn’t be hitting the panic and escape buttons at the same time. Knowledge of the Sun’s house position is no help either. 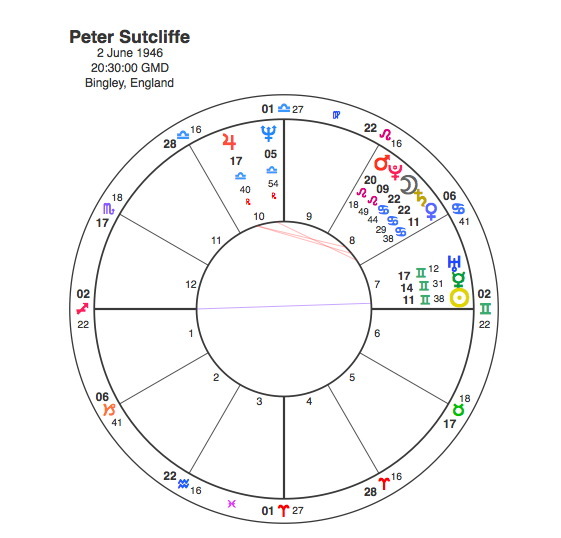 Sutcliffe has the Sun in the 7th house. The Sun’s position by house points to the area of life that is the most important for that person, its often an area that they feel quite comfortable and natural with and happy to spend much of their time and energy there. The 7th is the house of marriage and relationships and Sutcliffe, who was married to Sonia, was described by many as hard working and quiet, a caring and loving husband who kept to himself with no outward signs of the violence and depravity he had hidden deep within him. Even the Sun’s conjunction with the eccentric and sometimes erratic Uranus in the 7th would offer no clue, if this was the online date you would just think good caring husband who was a divorcee like most of the others. In the vast majority of charts of serial killers however, its not about the Sun, its the Moon. Astrology is usually very simple, the Sun is the daytime and the light, the Moon is nighttime and the dark. The Moon rules our unconscious reactions, emotions and instincts. Sutcliffe has the Moon in its own sign Cancer, often the sign of a shy sensitive character but also someone with strong and deep emotions. Invariably, this placing brings a sense of how such a powerful emotional orientation makes one extremely vulnerable and so a hard outer shell can be constructed to protect the self. Apparently Peter Sutcliffe was greatly intimidated by his fathers aggressive masculinity, but utterly devoted to his mother, a gentle loving woman who adored all six of her children. The Moon in Cancer will frequently produce strong maternal ties and this can have a big impact in later life. The big problem in Sutcliffe’s chart is the exact conjunction of the Moon with Saturn the principle of restriction. This placing shows a strong suppression of intense and powerful emotions and seems to be the key psychological cause of everything that followed. The Capricorn Research Project contains the birth charts of 551 murderers and the Moon conjunct Saturn is one of the most common aspects with a score of 41 against an expected figure of 30.5. Another notorious serial killer, Dennis Nilsen also has the Moon in Cancer conjunct Saturn, and Eric Harris one of the two killers responsible for the Columbine High School massacre in the US has the Moon in Cancer in the 8th house opposite Saturn. In Sutcliffe’s chart the cause may well be the Moon and Saturn but the result is found in the other members of the stellium. Mars and Pluto show the explosive, aggressive acts and Venus shows the targets to be prostitutes. The timing of events in Sutcliffe’s life seems to back up the idea that the Sun played a relatively minor role in his life. Pluto was in square to his Sun from 1962 – 4 , he left school in 1962 but it seems likely that he started using prostitutes during this transit. Pluto, of course is an important part of the 8th house stellium at birth and the first transit that it made to a member of that group was the square to Venus from Autumn 1975 to Summer 77. Sutcliffe killed his first victim, Wilma McCann on October 30th 1975, by the summer of 77 he had killed 5 times. The turning point in his life was when Pluto made it’s only aspect of his life to the Moon / Saturn conjunction, a square in 1980 – 81. Peter Sutcliffe was arrested in January 1981 and sentenced to life imprisonment in July of the same year. There are killers and there are serial killers, but there was something about the Yorkshire Ripper that caused even more shock and horror than other similar cases. Possibly this has something to do with the idea that Sutcliffe appeared to be living a normal, happily married life and friends and family were incredulous that the man they thought they knew so well was responsible for such vile acts. Killing 13 women over 5 years could not have happened if anyone had suspicions about Peter Sutcliffe. His chart not only describes his own character and the murderous events but it appears to point to an archetypal figure – the man who seems to live an ordinary life but is in reality a secret vicious killer. No wonder the story of the Yorkshire Ripper fills people with such horror. By the way, if Capricorn Research does ever branch out into astro dating advice, there is a promise to check out each chart in detail. Thanks for your comments. I’m not really sure what your view is ? Could you expand on this a little ?